Ideal for adventurous travelers, this 5-hour tour takes you through the stalactites and stalagmites of Playa del Carmen’s Mayan underworld. In a small group limited to 12, you’ll explore underground rivers, wade through mysterious caverns, and swim in the turquoise waters of cenotes. Lunch and the use of a helmet and lamp are included on this family-friendly tour, suitable for children ages 12 years and above. Begin your adventure at Restaurante Ocho, located on the corner of 4th street, where you’ll have chance to purchase refreshments before travelling for approximately one hour to the Yucatan jungle. Following a short trek through the jungle, you’ll be equipped with a helmet and torch, and listen to a safety briefing from your guide. Then, delve into the atmospheric cave network, replete with stalactites, stalagmites, and underground rivers. Marvel at colossal limestone columns and plunge into the cooling waters of underground cenotes. At no point during the tour will you be required to swim underwater or travel through tight, closed-in spaces, which ensures a safe and enjoyable day for all participants. 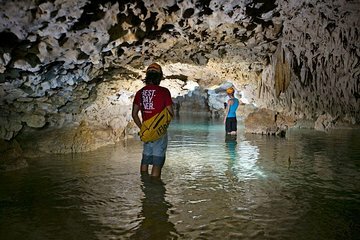 After exploring the caves for around 2.5 hours, you’ll return to sea level to revitalize with a snack and watch an ancient Mayan drumming ritual. Stop off at a local home to meet Yucatan residents before returning to your original departure point in Playa del Carmen. One on one with Pako on this tour. Was served a breakfast pastry as there is NO LUNCH. This tour took about 3 hours as we explored the underground system. Pako, a cartographer, knew every step of the place!! He made sure, at every step, that I was SAFE. Unlike the Rio Secreto tour, Pako had a wet bag which allowed me the opportunity to take pictures for lasting memories. We got to see all of the amazing formations were able to swim through areas and squeeeeeze through tight spots. This tour is not commercialized like Rio Secreto as you will be up close and personal with Mother Nature. Highly recommended.